Are you tired of suffering from chronic back or neck pain? Have you exhausted all other treatments and now find yourself considering the possibility of surgical intervention? Why not try something new? Non-surgical spinal decompression therapy is a new technology that has great success in treating a variety of ailments. The FDA approved spinal decompression machine is used primarily to non-invasively treat disc injuries (bulging and herniation), but has also been shown to have success in treating and improving symptoms associated with sciatica, back and neck pain, spinal stenosis, and osteo-arthritis. You may already be familiar with standard mechanical traction, popularly used in rehabilitation clinics to treat the aforementioned conditions. 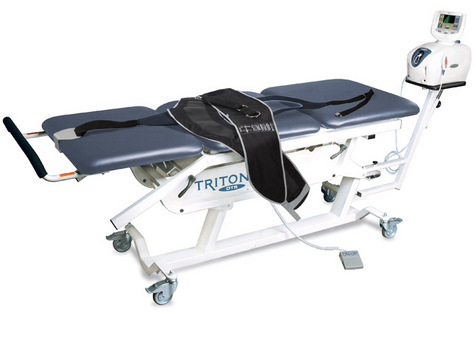 When using this machine, the patient is placed onto the table as the effected area is gently and uniformly stretched in one direction by means of a motorized rope. Spinal decompression therapy originated from standard mechanical traction. While the two machines work similarly to one another, decompression therapy incorporates several new features that allow it to be significantly more effective than its predecessor. - Whereas the traction machine pulls the spinal column in one direction at a uniform weight, spinal decompression relies on both distraction and relaxation forces as it works. In cycling between these two forces, the machine creates a "vacuum" of negative pressure within the vertebrae and thereby allows for any displaced disc material to be "sucked" back into the disc space. This will help to re-hydrate the disc, alleviate pressure on pinched nerves, and encourage healing of the affected areas. - Spinal decompression therapy is more sensitive to each patient's unique condition. The weight at which the machine pulls is determined by the chiropractor, uniquely chosen for each patient based on a series of factors (weight, condition, etc.) Additionally, the machine is responsive to changes in muscle tension, adjusting the level of force as needed to reduce spasm. How long/often can I expect to use spinal decompression? Depending on the degree of severity of the condition, the number of times that a patient uses the decompression machine will vary. It is common for an individual who has just started care to use the machine three times a week. Frequent use will more clearly demonstrate the efficacy of the treatment. As care continues and the physical symptoms of pain have subsided, the number of treatments needed will decrease. Periodic re-evaluations will show how the body has responded to the treatment. Treatment on the spinal decompression machine lasts roughly twenty minutes. Oftentimes the treatment is followed by application of heat or ice.